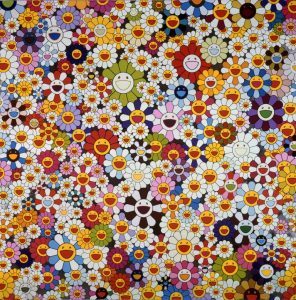 For looking outward 09, I chose Takashi Murakami’s artwork because his work shows me good art doesn’t need too much complexity. When I think about computer-generated art I always think of complicated shapes, colors, visual effect, etc. However, as Isabella says in her post: “after scaling, coloring, placing “randomly”, it can create a sense of depth out of the superflat drawing”, even simple single prototype (the flower) can make appealing effect. Also, the “randomness” used in the art is not completely random. Takashi Murakami must have constrained the size of the flowers, saturation of the color and composition deliberately. For example, there are always some small to medium sized white flower in between colorful flowers to balance out the various color and create harmony. I think that’s very important.